Do You Really Wanna Mess With Them? People infuriate us. Someone cuts you off in traffic, someone in the line in front of you is rude to the store clerk, someone takes exception with you texting while sitting in a movie theater. Whatever it is, people have the ability to push our rage and react button. The problem is that our reaction is not meant with a rebuttal of discourse or even a rebuttal fist in the mouth. No, our reaction is meant with cold, blue steel and hot, burning lead. Our reaction is met with the other person pulling out a gun and shooting us. Sometimes dead. This is serious and this is a problem. In addition to the movie theater incident mentioned above, a similar incident happened in the Tampa Bay area three years ago as well. Similar examples of rage are occuring at alarming rates throughout the country. For one, take control of our own behavior. Viktor Fankl once said* "between stimulus and response there is a space. 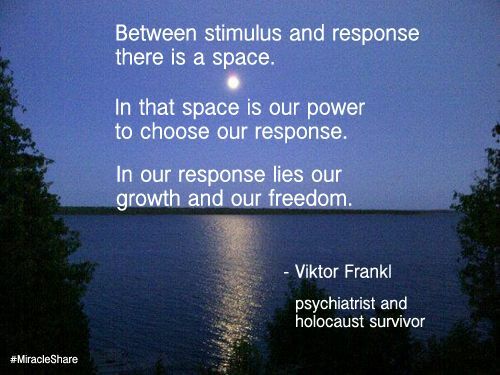 In that space is our power to choose our response..." The stimulus is someone cutting us off in traffic. The space is the time we have to decide: Do we mess with this guy? Or do we let it go? Our response is the action we choose to take. Is getting killed worth the seconds of supposed relief you get from venting? As you lay there dying you might think it was. The question you have to ask is: Is it worth it to your friends and family? *There is discussion that Frankl was not the first to say this. But I don't think anyone has been able to figure out who did. When does the landscape begin to change? eleven to Port Charlotte, Florida - right into the hotbed of professional tennis instructors located on Florida’s Gulf Coast. It was Monika and her parent’s intent to be the world’s top rated women’s tennis player. From Paris to Vancouver to Port Charlotte. Add to that Monika is one hundred percent Polish and the Florida move happened to coincide with normal pre-teen tumultuousness. The culture change bordered on overwhelming. Culture change wasn’t Monika’s only challenge. Fear and insecurity were right there in the mix. Fear of success and fear of rejection. When one harbors fear and insecurity, one tends to become walled off from one’s peers and classmates. Further isolation occurred in eleventh grade. School began to interfere with tennis practice. So she started homeschooling. Monika made a decision that year to confront her fears and insecurities. The notion to do this was beyond her years. In fact, when historians look back to determine what Monika did to become successful, they will discover that the year she rationalized her fears and insecurities by writing poetry, was one of the most pivotal in her life. an opportunity to enter and eventually win a national songwriting contest. That experience proved to her she had the power to make things happen. Not just your run of the mill things, but wonderful things. Monika went back to public school in twelfth grade, just about the same time as her desire to be a national tennis champion began to fade. Afterwards she attended and received a bachelor’s degree in International Studies from the University of South Florida - in the worst possible year for college graduates since the 1930’s - 2008. Monika then went back to school and obtained an MBA from USF as well. My Pieces of Freedom series so far has focused on professionals who labored their way through years of working for the Man or to be politically correct, Woman. The freedom that they are beginning to feel as entrepreneurs themselves, has been forged from the shackles of yesterday. Aside from a wayward owner / manager or so, Monika has not traveled this road. The freedom in her life, has come from bending the internal steel of insecurities with the hammer and fire of resolve. The steel however, has an annoying habit of coming undone. She must continue the fight. While the initial pounding required brute strength, Monika discovered an ally that proved to be of considerable help. It would add power to her hammer and force to her fire. It would ease her weary body, lighten her heart and bring hope. It would make all the difference. Her ally is love. In the thirty plus years I was a manager, I discovered many traits that contributed to my co-worker's success. For some reason one combination of traits seemed to stand out and run consistent with all. The persistence to figure things out,* make things happen and the ability to self-teach. Monika shines in all three. It’s why I would do business with her, buy whatever she sells and recommend her to anyone who will listen. Even with the bachelor’s degree and the MBA, Monika is self-taught. Add in the determination to figure things out, make things happen, old country values and ethics from her parents and the fact she’s only twenty-something, if one gets the notion that investing in her would yield a healthy return, one would be right. To identify what makes Monika Begdouri so special we need to pull the curtain back on what motivates her as not only a professional photographer, but as a wife, daughter, sister, friend and business person: Love. She is passionate about photography and loves her craft. Monika doesn’t just take pictures, collect payment and go on with her life. She is lasered in on capturing moments of love. She wants her clients to look back one day at those pictures and remember the love and to feel the positive emotions that surrounded their special occasion. What motivates Monika also accelerates her talent. This is my WHY to whatever it is that she is selling. It isn’t about revenue, profit or fame, it’s about making a difference in someone’s life. And that makes all the difference. Feel like making a comment or telling Monika how you feel about Mona Paris Photography? Please visit the Mona Paris Photography Facebook page and look for this post dated 1/12/2014. *the second part of this one is to know when to ask for help. What does quiet sound like? Quiet is when you're in a room with over one-hundred people listening to a couple tell the story of how their daughter survived childbirth - all one pound and four ounces of her, and you can hear over one-hundred hearts pounding to escape the prison of their rib cages...thump, thump, thump. That's quiet. I attended the Write Your Hearts Out, Tampa Bay event at the Straz Center this past Sunday. The speakers were insanely talented authors. A couple of Pulitzer prize winners, writing professors, two columnists, two fiction authors and a gentleman who is referred to often as the best writing coach in America. And as if this wasn't heavyweight enough, the Poynter Institute, one of the most prominent journalism schools in the word, sponsored the program. There was more literary and journalistic knowledge in that room than air. Attendees came to learn about writing. And we did. But we were on the edge of our seats, trying to keep our hearts from exploding because a couple took turns telling the story of how their precious daughter survived childbirth and the subsequent months prior to her hospital release. When a baby is born at the edge of viability, which is the greater act of love: to save her, or to say goodbye? I was not about to read a three-part piece to learn that this brave couple had to say goodbye. Sorry Kelley. Tom and Kelley are an intriguing couple who seem to be thriving in the land of opposites. Tom seems laid back and Kelley doesn't. After listening to Kelley talk for a few minutes, the words wild child popped into my head. That character of hers combined with a straight-forward-tell-it-like-it-is-genuineness and I could listen to her stories for hours. Here's Kelley's story. These are Juniper's actual footprints.